I own three EarthCaches. With the new app that is free, there are many new users "trying things out," so to speak. However, with this volume of new cachers, they have no idea how to search for an EarthCache, at least, and probably other cache types where answers need to be submitted. Is there any way the types of caches that need answers messaged or e-mailed can have some kind of pop-up that links to Groundspeak's help link on how to find that cache type? I have been inundated with requests for help, logs showing the Found It icon but with the message saying they couldn't find the container or don't do it unless you like [insert topic of EarthCache]. I do have the disclaimer that they need to e-mail me, which is active, or message me on all three EarthCaches. I am going to link to Groundspeak's help section on EarthCaches, but I'd appreciate some help from Groudspeak, as this problem did not exist prior to the free app. All my EarthCaches are open to all members, and I would like to keep it that way, but help for the COs is needed. Here is a screenshot of the Help video and its accompanying text, which says there's no container and that questions need to be answered. When a geocacher selects an Earthcache to navigate to, this same video and text appears as a popup help tip. Do you have specific suggestions on the content of the existing Help resources within the App? Your post sounds like there is no Help provided within the App, or a popup, but there is. Getting people to use the resources? That's a different question! You might try something similar for your Earthcache. Copy and paste the blurb on the video "Earthcaches don't have a physical container. To log this geocache, you'll have to answer questions in the description." <<Cross-posted in Android App>>I own three EarthCaches. With the new app that is free, there are many new users "trying things out," so to speak. However, with this volume of new cachers, they have no idea how to search for an EarthCache, at least, and probably other cache types where answers need to be submitted. Is there any way the types of caches that need answers messaged or e-mailed can have some kind of pop-up that links to Groundspeak's help link on how to find that cache type? I have been inundated with requests for help, logs showing the Found It icon but with the message saying they couldn't find the container or don't do it unless you like [insert topic of EarthCache]. I do have the disclaimer that they need to e-mail me, which is active, or message me on all three EarthCaches. I am going to link to Groundspeak's help section on EarthCaches, but I'd appreciate some help from Groudspeak, as this problem did not exist prior to the free app. All my EarthCaches are open to all members, and I would like to keep it that way, but help for the COs is needed. I think it's also worth mentioning that users of the Free app will only be able to see Earth caches if they are Premium Members. The app will only display Traditional caches to app users that are Basic Members. Here is a screenshot of the Help video and its accompanying text, which says there's no container and that questions need to be answered. 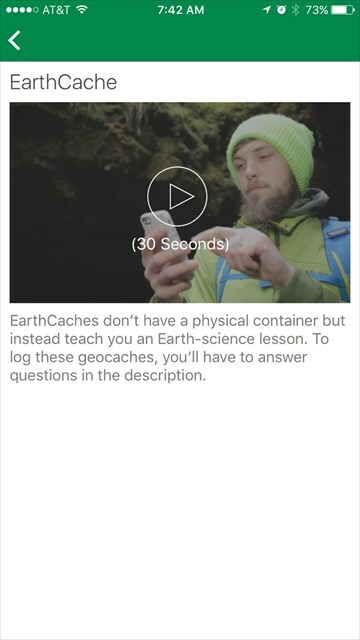 When a geocacher selects an Earthcache to navigate to, this same video and text appears as a popup help tip.Do you have specific suggestions on the content of the existing Help resources within the App? Your post sounds like there is no Help provided within the App, or a popup, but there is. Getting people to use the resources? That's a different question! I would suggest that the pop-up text includes a note that the answers have to be sent to the CO. I would use wording of "sent", rather than "emailed" or "messaged", to avoid promoting either of the communication options. Cachers should be able to figure out for themselves how to communicate with another member. "Earthcaches don't have a physical container. To log this geocache, you'll have to answer questions in the description read the cache description and send answers to the cache owner. "This is an EarthCache, so there is no container to find. To log this EarthCache, you must read the information below, visit and observe the location, and send me your answers to 3 questions about the location's geology." Think there needs to be a "Dont post the answers in your log" as well. I guess users paying attention or applying is the rub. I just deleted another log, whose log stated, "Found It but I didn't do the questions," and that was after I had provided this link in the Summary Click here for how to find an EarthCache, which links to topic 4.10 in the Help Center about Logging an EarthCache or Virtual Cache. I may just make them Premium for a while, but with the other reply that the new app only shows Traditional caches to Basic Membership subscribers, I can't figure out the best way to keep getting slammed from new cachers, and all have been new cachers 45 finds or less, when I haven't had this problem to this extent. Prior to the new app, I would have about 1 log without answers or goofy log about every six months, if that. I've deleted 10 in the last week, alone. Don't know if this is the right forum, but I love doing Earthcache but have a problem with them on the new iPhone app. I love the feature to Message the Owner", but it brings up a bug in the app. I try to copy and paste the questions into the message to the owner, but I find that when I try to select text from the description, it always scrolls to the top of the description. I then have to select virtually all of the description, copy it to the message, then delete it. I would love it if the feature to would automatically copy in the text for the questions.